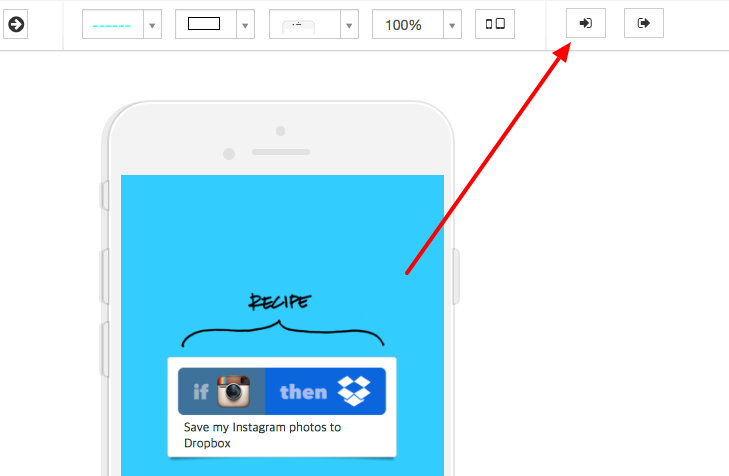 How to create 'IFTTT' template? We have chosen this experience to write a step by step "how-to" to help get you familiarize with our platform. We will be discussing the elements beginning from the top and working our way to the bottom. Let&apos;s create the first screen. The first element on this screen is the default element that appears on every screen, Screen settings. We moved the screen settings to be placed at the very bottom of the screen. For the &apos;Color,&apos; we chose a baby blue (#a7e9ff). The &apos;Canvas background color,&apos; we chose a darker blue: rgba (51,204,255,1). 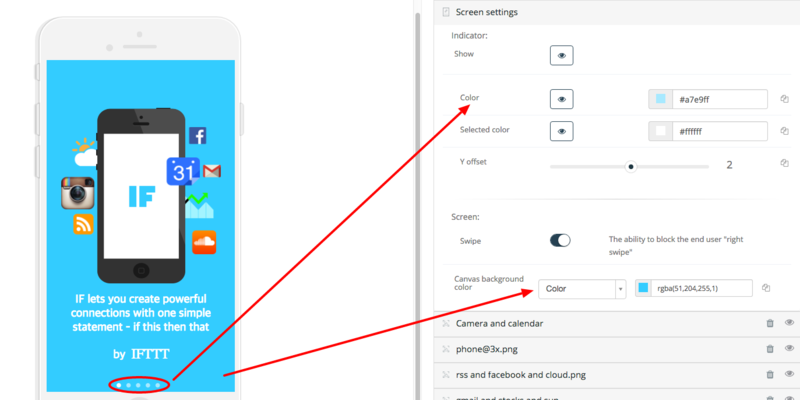 The next element that is placed on the screen is an image &apos;Camera and calendar.&apos; This is placed in front of the iPhone. 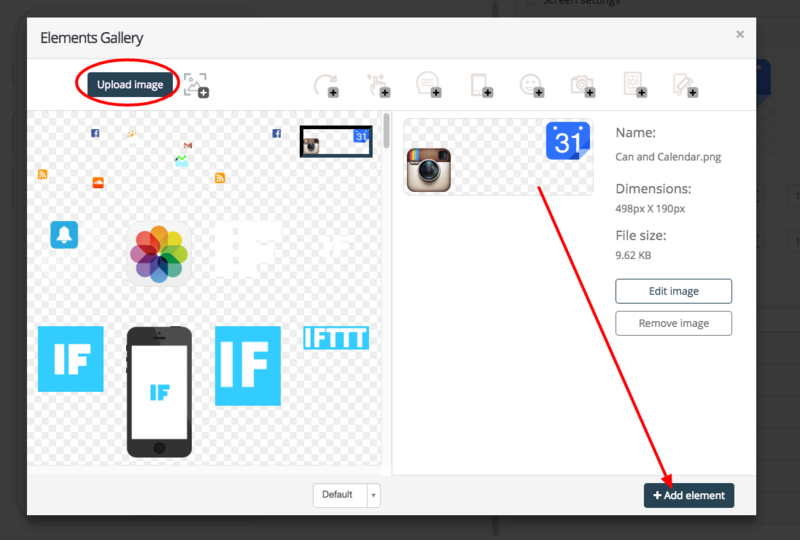 To upload photos click on the &apos;Image Element &apos; located on the left side of the dashboard. The next element that was placed on the screen is an image &apos;phone@3x.png.&apos; The image is the main feature of the screen. 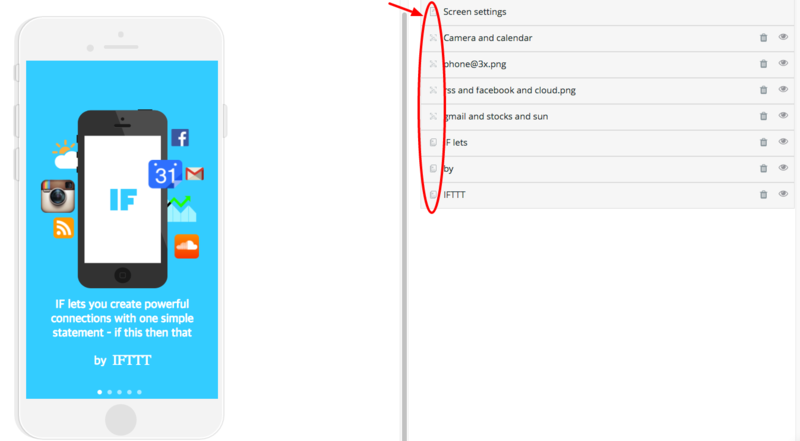 Follow the instructions from the Camera and calendar image on how to upload. Then, we added three text elements. 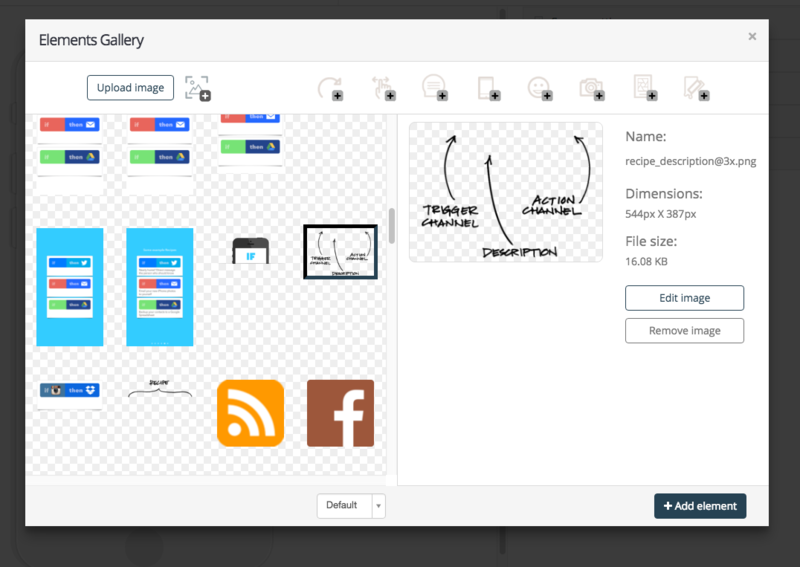 Click on the &apos;Text Element &apos; located on the left side of the dashboard, underneath the &apos;Image Element.&apos; These are the last elements for this screen. 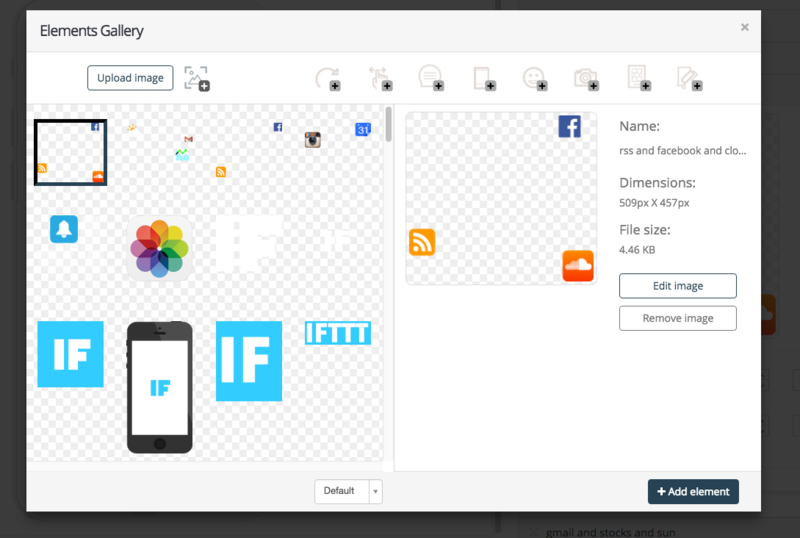 Each text is a separate element: the three elements are IF lets, by, and IFTTT. Screen 2: We added a new screen, but kept the same background color. This screen has very few elements. 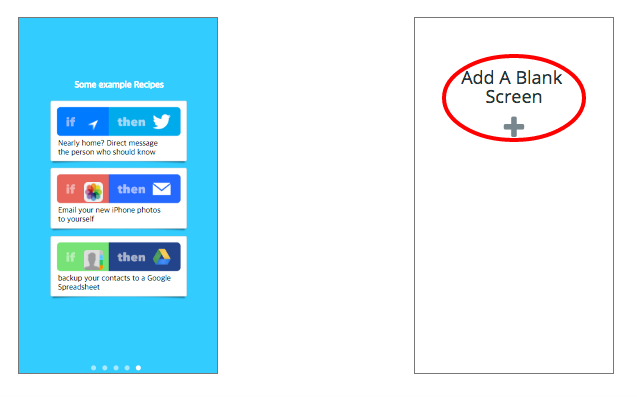 There are two text elements that were placed on the screen: Save and Recipes. We placed the Recipes element underneath the image. 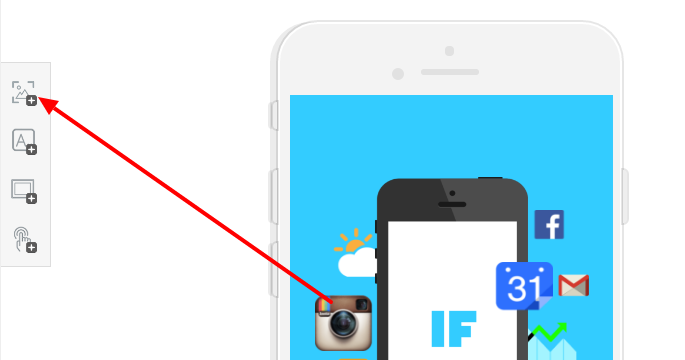 The Save element we placed on top of the instagram_to_dropbox@3x.png. We then uploaded two images, recipe_marker@3x.png and instagram_to_dropbox@3x.png. 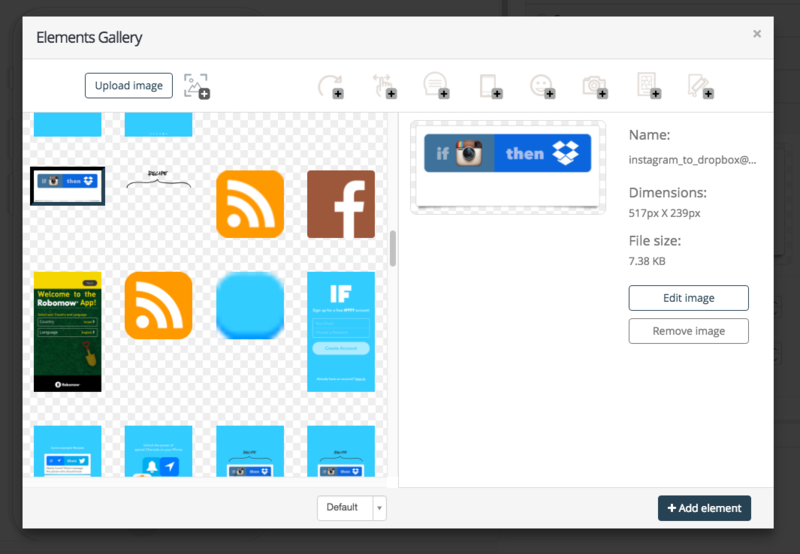 Review screen 1 on how to upload images that you create. Screen 3: This screen is a copy of screen 2. There are a few differences though. Hover over the Screen #2, and you will see this option - &apos;Duplicate Screen,&apos; click here and then click OK.
Then click &apos;Edit&apos; on Screen #3 to go back to editing your new screen. We removed the Recipes text element from the screen. To remove any element, click on the trash can by the name of the element. 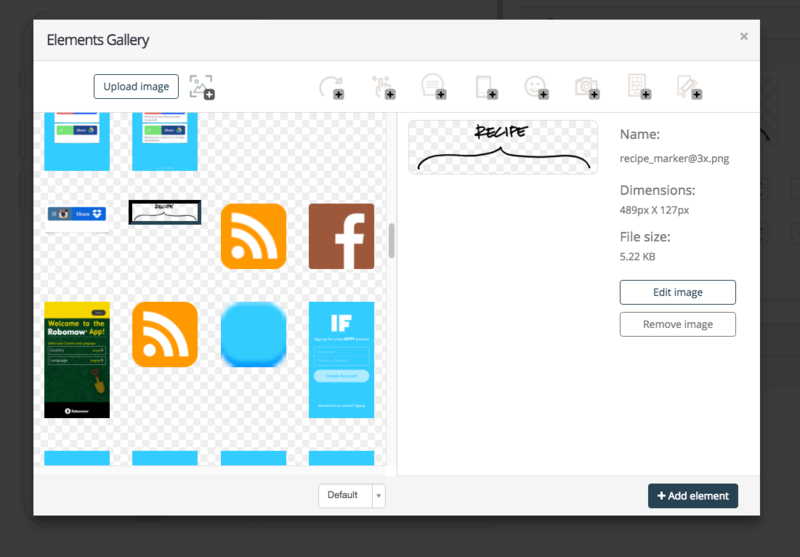 We added another image to the screen, recipe_description@3x.png. Screen 4: This screen is a new screen. Review screen 2 on how to Add a Screen. The background color is the same as the other screens. We added a bunch of images to the screen: icon-locations@3xcopy.png, icon_photos@3x1.png, icon_contacts@3x.png, Bell and beams of light.png, and bottom_phone@3xf.png. 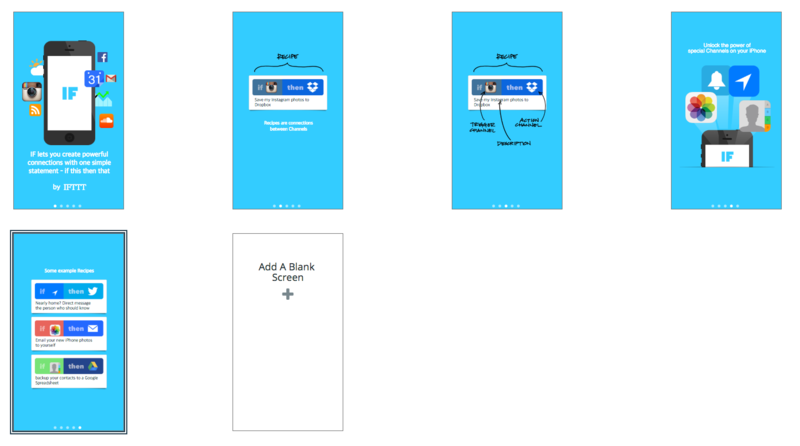 If you forgot how to upload an image return to screen 1 for detailed instructions. The last element that we placed on the screen is a text element, Unlock. The Text Element is located on the left side of the dashboard. 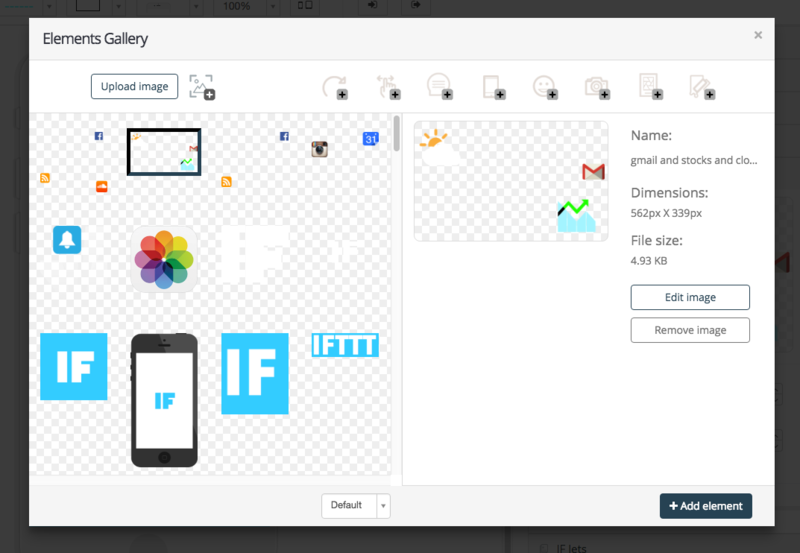 We placed the element on top of the screen, above all the images. Screen 5: The last screen for this experience is also a new screen. There are four text elements that we have added to the screen. Three of the elements, we placed on top of the main image: 3 if then.png. The text element, Some, was placed above the images. 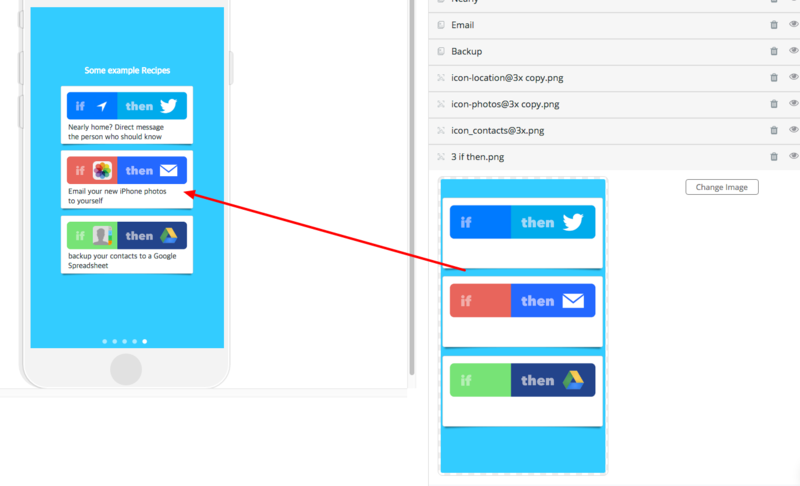 There are a few image elements from screen 4, that we have placed in screen 5: icon-locations@3xcopy.png, icon_photos@3x1.png, icon_contacts@3x.png. 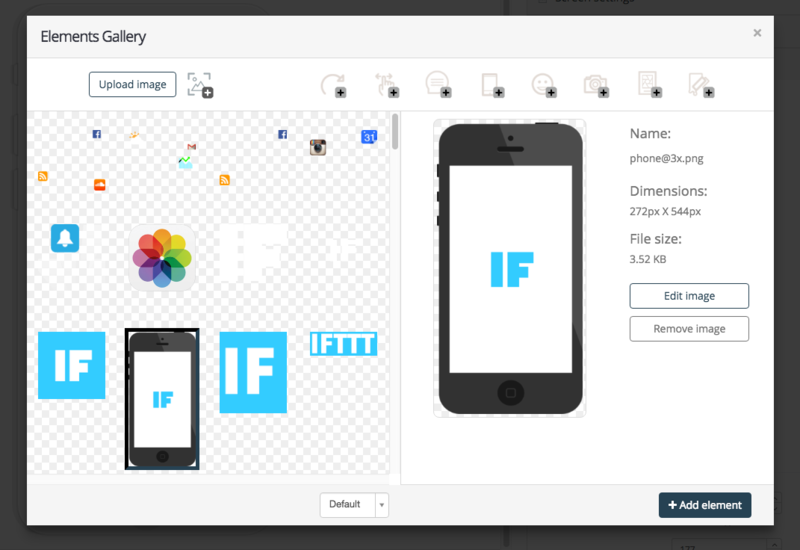 The last element that we added on the screen is an image that we uploaded, 3 if then.png. The image is placed behind all the other elements. 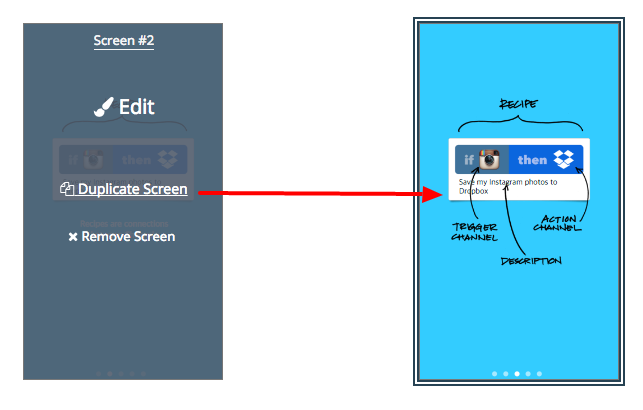 Transitions: When you are finished with all your screens, begin to set the transitions, the flow between the screens. You will find these buttons, &apos;Transition Inbound &apos; and &apos;Transition Outbound ,&apos; on the top of the screen. By clicking on one of these buttons, you will navigate to our transitions studio&apos;s platform. Lets begin by going over what is happening during this transition. Most of the elements for the Inbound are moving in with the screen while the Outbound elements are either moving out to the right or with the screen. Here is how to use the transitions. Make sure to reorder the elements that all will be under the &apos;Inbound&apos; group and the other elements will be in &apos;Outbound.&apos; Here is how to transition each element. Lets begin by going over what is happening during this transition. The transitions for the two screens are either moving with the screen or switching. Lets begin by going over what is happening during this transition. The transitions for the Inbound are fading and moving in from the bottom of the screen. The Outbound transitions are moving out of the screen to the left of the screen. Lets begin by going over what is happening during this transition. The transitions for the Inbound are either moving in with the screen or switching from the outbound elements. The Outbound transitions are switching, moving out of the screen, and fading out of the screen.